Not many superheroes are better suited for kids’ dress-up play than Superman. After all, his days as the Baby of Steel are a vital part of his origin story. Heck, the third panel of the very first Superman comic shows a diapered Superbaby hoisting a chair over his head. There are plenty of heroes out there who donned their first capes early on in life, but you’d be hard-pressed to find many who were juggling heavy farm machinery and flying around their living rooms at the age of three. Now there’s a hero a toddler can relate to! Granted, your little one probably didn’t arrive here from a distant, doomed planet, and it’s more than likely that the only power they draw from the Earth’s yellow sun is a superhuman ability to wake you up the instant it rises in the morning. But super achievements are all relative. For some kids, it’s leaping tall buildings in a single bound. For others, it’s climbing to the top of the jungle gym without any help, or pouring a glass of milk and only spilling a couple of drops. Superman would be the first to tell you that you don’t have to be rounding up escaped prisoners from the Phantom Zone in order to be the hero of your own storyline. Still, it’s fun to pretend, especially when you’ve got all the right equipment to look the part. 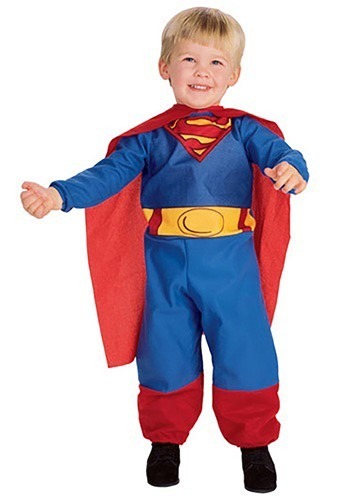 This polyester jumpsuit has all the classic Superman styling, including the red-and-blue color scheme, a printed yellow belt, and that iconic “S” emblem on the chest, with a red tear-away cape and faux boot cuffs for the final heroic touch. You don’t have to be a Superkid to be a super kid, but this outfit brings you that much closer.